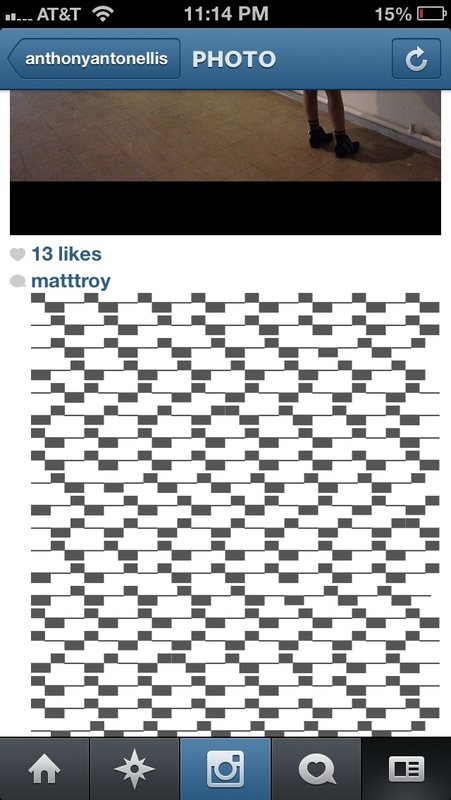 Screenshot of a portion of a comment made by Matt Troy on a photo posted to Anthony Antonellis’ Instagram account. Some people without much imagination, probably the same people who say that graffiti is not art, might be more likely to label Matt Troy a spammer than an artist, but his spammy art is actually somewhat brilliant. One of Troy’s projects is to make ASCII art, much like what some Twitter artists are doing, in Instagram and leave the ASCII art as comments on his own photos (which are themselves often screenshots of his ASCII art) and as comments on other people’s photos. Typically, Troy’s ASCII images are repeating patterns that can go on for so long that they cannot be displayed on the screen of a phone in their entirely without scrolling. The user has to scroll and scroll many screen heights to get past just one of Troy’s comments. The comments Troy leaves on his own photos have essentially the same effect as most Twitter art since it only appears in the streams of his own followers, but, like @glitchr_, Troy’s comments are disruptive to his followers streams because they go on and on to the point where scrolling past them can cause the Instagram application to slow down and scrolling can become jumpy. Still, it’s the choice of Troy’s followers to experience that from time to time and it’s not sharable, so not really viral art. Instagram doesn’t have the same sharing functionality that most viral art platforms have, making it a stretch to say that organic viral art can be distributed over Instagram even if there is an unmediated distribution of art between artist and fan (although of course a photo from Instagram can be taken and shared onto other platforms like Tumblr or Twitter). Despite Musson’s sarcasm, Troy’s comments are a lot like graffiti or street art. I know of hardly any form of invasive viral art that is more like graffiti. And hardly any graffiti writer or street artist would claim a sovereign right to do what they’re doing. Just because an artist gets up doesn’t mean they don’t expect their work to be removed. The comments invade a digital space, and they take up a significant amount of screen real estate. Users have scroll on and on just to get past them. When they appear, they cannot go unnoticed like most comments on Instagram. Troy’s ASCII art comments, when left on other people’s photos, are a very invasive form of invasive viral art. They might be removed by Troy’s targets, but not instantaneously. It might not spread very far since it can’t easily be shared, except through screenshots or by other people commenting and individually tagging people whom they want to share the work with, but it does expose people to unexpected art and to Troy. Every comment almost inevitably reaches large groups of users who would never otherwise come across Troy’s artwork. It’s graffiti on Instagram. It’s invasive viral art. The entirety of a comment made by Matt Troy on a photo posted to Anthony Antonellis’ Instagram account. This simulated screenshot gives an idea of how long Troy’s comments are and what kind of a screen it would take to display one of them in a single frame. To actually see the entire comment on a phone, the viewer must scroll past it. Note that Antonellis responded in kind with a similar comment of his own.